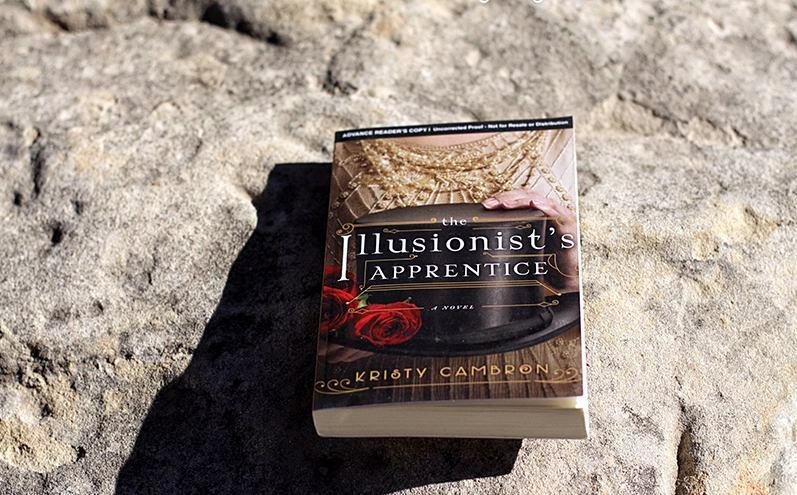 The M&H team read Kristy Cambron's The Illusionists Apprentice prior to its release and fell in love. The fiction novel is layered with mystery, illusion, and the artistry of the Jazz Age. It's a journey through love and loss and the underpinnings of faith. If you need a summertime beach read, this is your go-to! Milk and Honey Magazine was lucky enough to have a chat with Kristy about life as an author, encouragement for young women, and how to stay healthy (spiritually and physically)! I’ll answer that in a few words: Harry Houdini, Jazz Age, vaudeville, Boston, and 1920s fashion. With the opportunity to research and write a Downton Abbey-meets- 1920s Boston mystery, what author could possibly say no? And while it’s the history that first hooked me in, it was the faith journey of the characters that kept me inspired throughout. I really wanted readers to grasp the truth that only one man has overcome the grave, and that was Christ Jesus. To write that through the lens of such a vivid time in history was just a bonus. Who is the book best suited for? Anyone who has a social media account. I say that with a bit of a grin, because it’s actually true. Main character Wren Lockhart’s story is really about living with authenticity. Though Wren’s is a historical story, social media can be an example of the “stage” style of living– of putting on a show of having it all together when in truth, faith can be messy. And life gets real sometimes. And what we live behind the scenes is often not the same story that’s put out under the stage lights. I wanted this book– and Wren’s character in particular– to explore living as our authentic selves, including our past hurts and our hopes for the future. Have you always loved to write? What is your writing journey like? Sisters, listen to the voice deep inside that says, “I think I want to grow up and be a ____.” I always wanted to be an artist. But when I grew older and realized I hadn’t been blessed with hands that could fashion art on a canvas, imagine my surprise when God whispered, “You’ll paint with words.” Even from five years old, that love of art and visual storytelling has always been engraved on my heart. Now I wake up every day grateful I get to live a dream I had when I was young– just in a way I’d never imagined. In a nutshell, what advice would you tell your 20 year-old self? A few things: Don’t quit. No matter how hard it gets on the dream-chasing journey, keep going. Smile more. Worry less. Love well. Throw out the scale. Wear sunscreen. And… don’t wait to forgive others, or yourself. You’re not going to be perfect; that’s what grace is for. What are you up to now? What's a typical day like for you? I love this question because “typical” got thrown out the window when I left my former corporate America career. Now, there’s a shifting answer based on the day. I can literally go from shuttling kids to school, to a coffee shop to write, back home to do a quick radio interview, head to the store to squeeze in grocery shopping and do some reading in the kids’ car line– all before dinner. (And in a messy bun, literary tee, and my Chuck Taylor tennies.) This author role has an always-moving schedule, but I love every minute of it. Describe how your faith has impacted your life. I didn’t fully understand my faith until a few years ago. On the same day my first publishing contract came through, and hour later I received a call from my Dad. He said: “This could be bad. I may have leukemia.” Our family spent the next five months with the mountaintop-highs of living an author’s dream, balancing that with the valley-walking lows of battling cancer, grief, and loss. In those days, I learned a valuable lesson in the faithfulness and unending love of Jesus. He was willing to surrender all for us. Accepting that gift of grace means my life is no longer my own. I can’t pick and choose my faith moments out of easy times– it’s an all-or- nothing surrender through the highs and lows of this life. You're so pretty and fit! How do you keep in such good shape? Diet or exercise? What's your dream life 10 years from now? In my former corporate career, we did goal-planning on an annual basis. Often, we’d talk about what we expected to be doing two… five… even ten years down the road. It’s a good thing to plan and work towards goals. But the day I left that career, I wanted only to answer the call that had been placed on my heart. So I threw my ten-year goal plan in the trash. Why? Because this is God’s business. And in ten years, I want to be doing exactly what He’s asked me to. Whatever that looks like– I’m just excited to be a part of it! Absolutely! I have a few new projects in the works… My new historical fiction Lost Castle series will debut in February, 2018– with Book 1 set in a French, fairy tale castle. (I just finished writing that one and I can’t wait to share it with readers!) On the non-fiction side, I’ve partnered with my current publishing family at Thomas Nelson (HarperCollins Christian Publishing) to publish 2 DVD Bible studies on Verse Mapping – the Gospel of Luke and the Book of Acts. You can expect the Verse Mapping Series to debut in spring, 2018 as well. Visit KristyCambron.com to connect with Kristy and order The Illusionists Apprentice now!